Your idea needs the proper environment to develop. Find a strong counterpart to discuss and push your idea so it can develop and mature to its best. An idea will have to go through several step to become a product. It will have to comply to the scope, safety regulation, manufacturing guidelines, users' requirements, structural integrity, etc. We are the right partner to assist you through those steps. The faster and the more prototypes of your idea you see and try, the soonest you can get feedback from beta testers, see the flaws and the potential ameliorations. 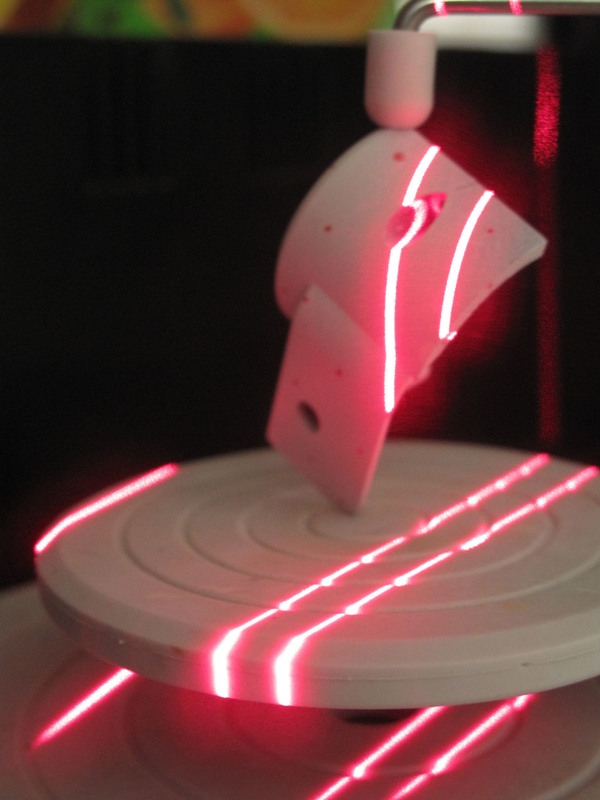 We use Selective Laser Sintering: the industry leading standard for e-manufacturing. We offer more than 12 materials to choose from to reach the finishing and material requirements up to the expected final product. 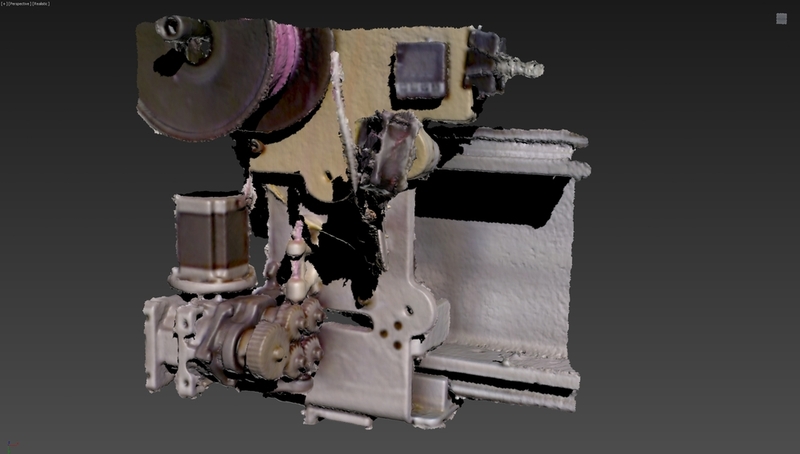 We can 3D scan parts and 3Dprint them again in the material of your choice, reverse engineer them and make them better. Brass shells with unique design hinge, open to reveal a moving silver mirror. All parts 3D printed to make a completely new kind of object. TheObsessiveDrafter (TOD) is an autonomous robot arm that draws portraits of the people it meets. It has been designed and engineered from scratch. It is made of 3Dprinted connector and aluminium tubes, it runs on Arduino. We designed, 3Dprinted and cast in recycled aluminium a complete set of affordable public furnitures for outdoor. Wood is also reclaimed from construction (formworks logs). The design takles the great strength required by the program while giving a very light and sharp silhouette. We designed a dozen of models of frames that can be parametrized to fit the data from a 3Dscan of the head of a client. We manufactured them using our industrial grade 3Dprinting machines and materials. We produced frames made from 100% plants (castor oil polyamide), regular polyamide and concrete. 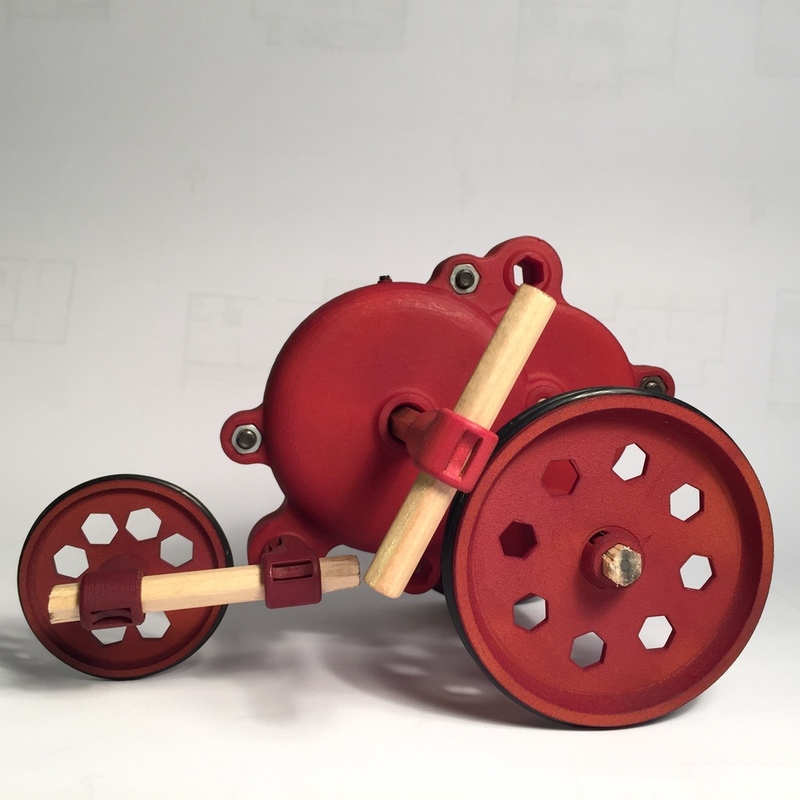 We engineered, designed and manufactured spring motors for the Construction toy QalamSila, that can run large and complex structure that this toy allow to create from wood pencils and 3Dprinted connectors and gears. (laser cut annealed steel and brass, SLS 3Dprinted Polyamide). 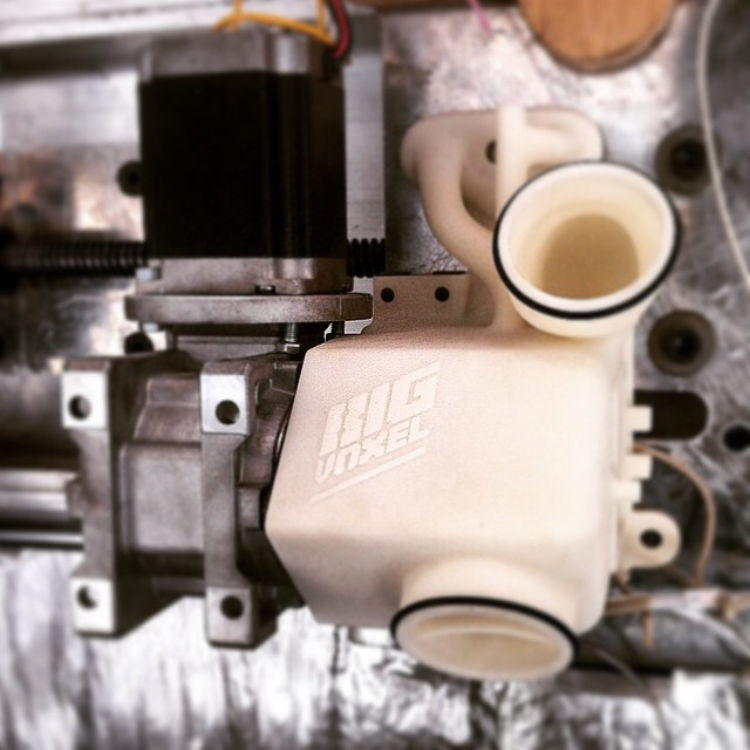 Big Voxel is a prototype for a line of very large FDM 3Dprinters we designed, engineered and manufacture. 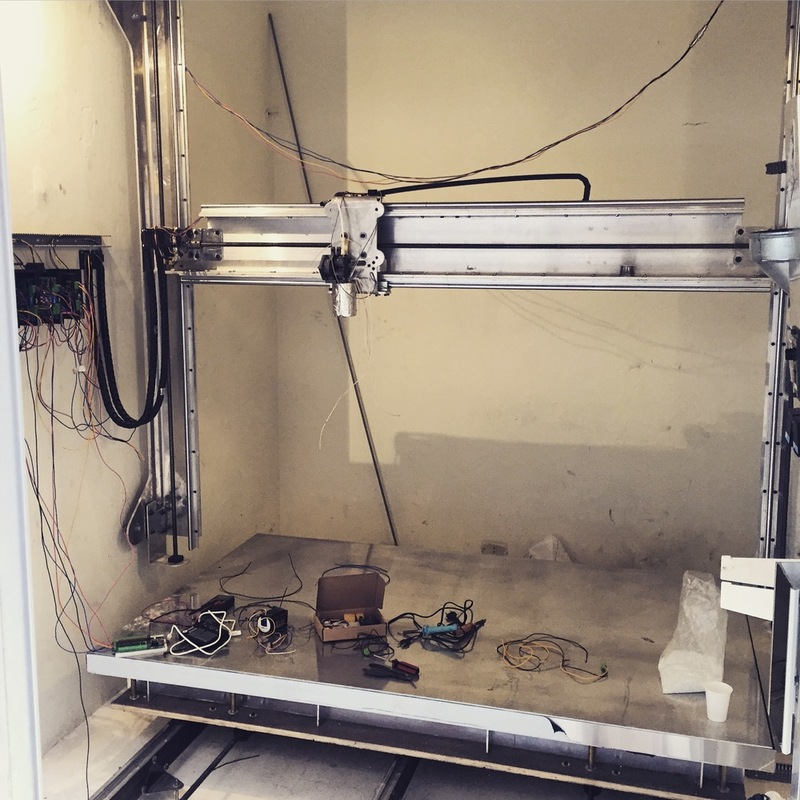 It can 3Dprint object as large as 2x2x1.2m out of recycled ABS plastic. 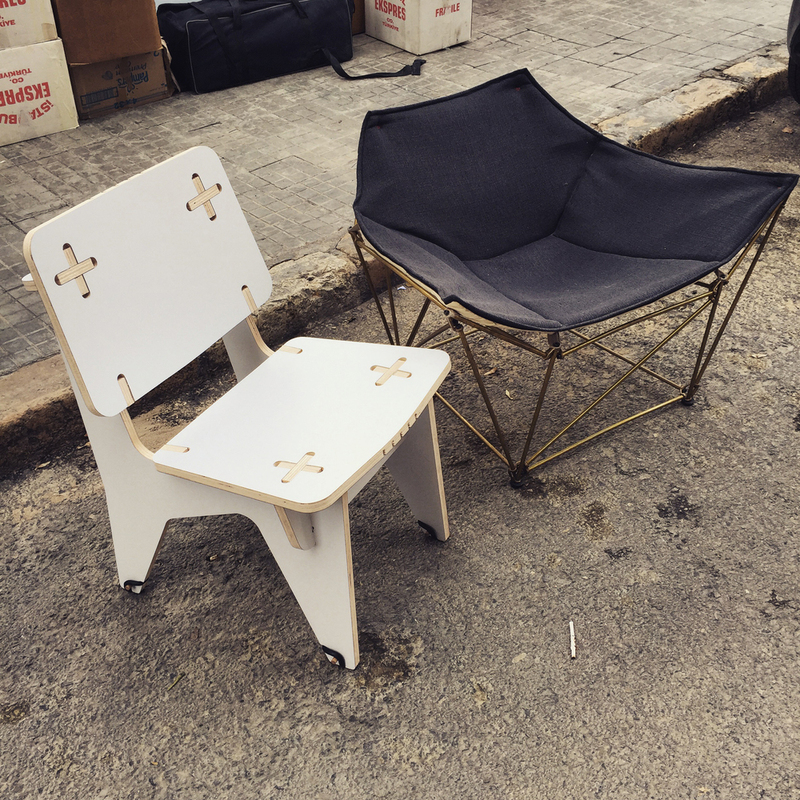 Dirasya is a low-cost, user assembled, CNC cut plywood chair. Hyperstat is a system of 3D printed brass connectors that allow to create large and and sturdy spatial structures (here a couch). Hyperstat nodes are generated through a parametric script. QalamSila is a construction toy. A large library of 3Dprinted joints allow the user to build large, complex structures and mechanism out of regular wood pencils. Many models are already available, and we are developing an online App' to allow anyone to create assemblies online and to order their custom creations directly. 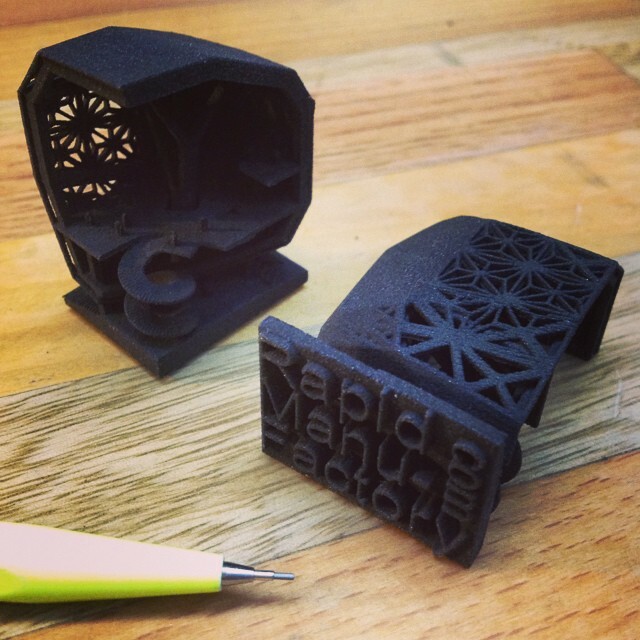 Nylon-N is an affordable SLS 3D Printing powder color actively developed by Rapidmanufactory. The parts are 100% white and slightly translucent. Making it an attractive for architectural scale models. One stop for all: Check this document (link) for promotional offers on architectural scale models! Pros: Very cheap, extremely white, slightly translucent and flexible. Cons: Sensitive to aqueous solutions (but not oil). Not recommended for thin functional parts. Printed by SLS, polyamide 12 powder from France, off-white to very soft pale yellow color, slightly translucent (when thin (less than 1.5 mm)). The finish of those parts is very smooth. No need for polishing. Very flexible when between 0.6mm - 1mm, very solid when above 1.5mm, can print living hinges, functional ball bearings, etc. Very flexible when between 0.6mm - 1mm, very solid when above 1.5mm, can print living hinges, functionnal ball bearings, etc. Parts are dyed with dyes for whool, after the 3Dprint. Parts are dipped, only one color per part is possible. Printed by SLS, polyamide 11 powder from France, ultra precise and Black. The finish of those parts is smooth, and can be extra polished. RapidManufactury engineered its very own Concrete SLS powder, which is a complex mix of a special polyamide with cement powder, hollow glass micro spheres and other additives. It has a very rough feel. The part is sintered by the laser and then cured in water. The parts obtained are tough and somehow flexible, but more brittle than regular polyamide 12. We do not recommend to go under 0.8mm. The part can have very rough cracks and texture, and it is the charm of it. Brass is an alloy made of copper and zinc. The part is 3Dprinted in polystyrene by our SLS workstation, the part is then dipped into hot fundry wax, and finally cast in foundry plaster. The plaster is heated for several hours at very high temperature. Polystyrene burns away, leaving very little ashes. In the void left in the plaster, molten brass is cast. The plaster mold is broken, parts are sand blasted. Rough parts need to be filed, deburred and buffed, in order to get the usual finish. Those parts can be plated (gold plated for example). The parts are cleaned up from fundry (sprues are grinded), polished, and buffed (to mirror level), on the surfaces that the tool can reach only. Polishing is manual, and choices are being made between keep edges of the shape readable and the level of polishing reached. 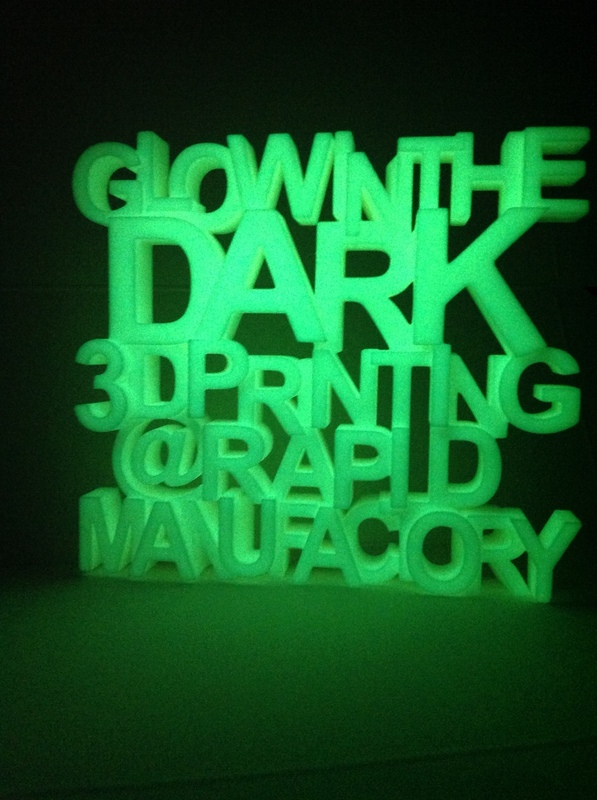 Glow in the Dark is a polyamide based powder engineered by RapidManufactory (tm). It is the only one to be used in Selective Laser Sintering (SLS) process. It gives very smooth, precise models that are strong and flexible. Parts can be polished and used in everyday life. The chemical component that stores light's energy and give back over time is a mineral, it is safe and does not emit harmful radiations. It is kid safe and can be kept in contact with the skin. The part will shine very strong after exposition at an intense light. For several minutes you can even use it to light a dark room or to read a book in full darkness. The glow will reduce gradually over several hours. 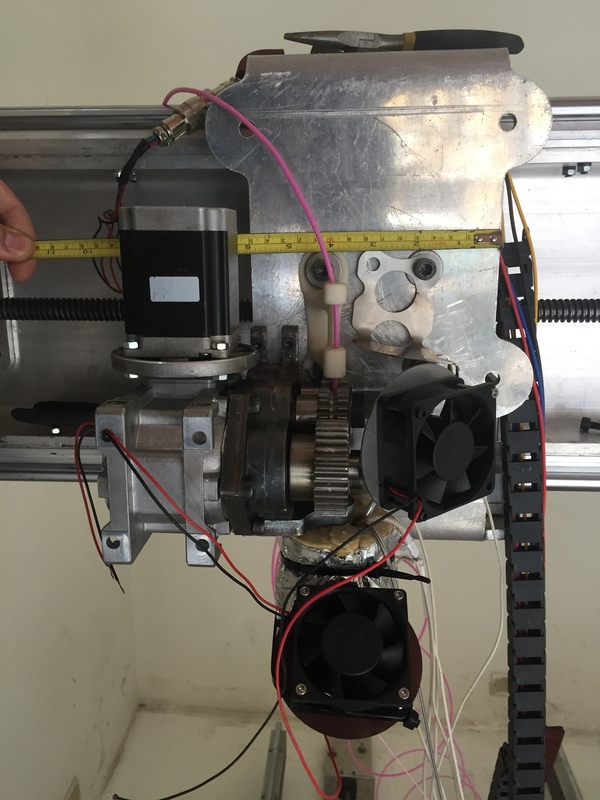 The Polystyrene SLS 3Dprint is used as lost wax in investment casting, the parts produced are +98% accurate. They are polished and electro-plated in silver. Polystyrene has the property of burning very well leaving very little ashes, that's why it is used in lost was casting process. It has a fair strength and a good surface finish, which is enhanced by wax infiltration. It is mainly dedicated to the fundry process, but it's great rigidity and very low density makes it a great choice for aeromodelism, floating devices and research when a very light weight is to be achieve. A painting coating can easily solve the porosity issue and protect against shocks. The parts have a very white color and are transluscent. Our most sensual material. Dark soft grey polyamide, with excellent mechanical properties, Dark Velvet is a proprietary material of RapidManufactory. It gives a very refined touch to 3Dprinted products. Status: Not available at the moment. 3D printed with UV resin on a very high resolution SLA 3D printer, the parts produced are very precise (50 microns resolution), and quite flexible/elastic. The part are yellow and translucent. 3D printed with UV resin on a very high resolution SLA 3D printer, the parts produced are very precise (50 microns resolution), hard and tough. The part are yellow and opaque. This 3D printing technique requires printing supports, if not uploaded with the 3D model, additional charges will apply.